GUMNUTS.....AND OTHER STUFF: Four Nights on Kangaroo Island South Australia. Day Three - 1st May. Four Nights on Kangaroo Island South Australia. Day Three - 1st May. The weather to was suppose to be terrible, rain, wind and thunderstorms with hail, looking across to the mainland in the morning it looked like someone was copping it. 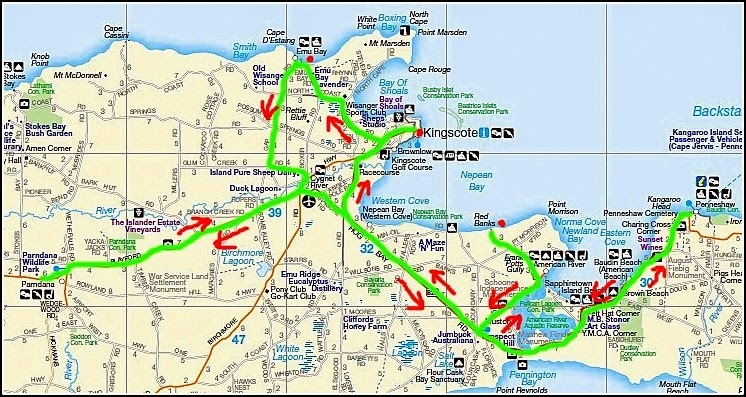 Today's plan was to go have a look at a look at Kangaroo Island's 'best kept secret' Red Banks, then onto Kingscote, Emu Bay and with a bit of luck Stokes Bay. There were no signs to direct you to Red Banks, there was a Red Banks Road (dirt) that went in the general direction but you had to use your sense of direction and turn off onto Flea Castle Rd, dirt and narrow and still no mention of Red Banks. Starting to drizzle and on a clay sandy track with nowhere really to turn around we kept on going until the road ended at the coast. There was a small turning where the road ended but it was muddy black soil and I didn't think 'Zorro' would take to it very well so it was a quick 3 point turn over the grass edge. Anyway I had found the 'secret place', down the gully to the beach and there were the 'Red' banks, was it worth it......well yes. The seals at Kingscote kept us amused and some of the other wildlife seen, while not 'firsts', added to the enjoyment of the drive. Heavy rain and time running out kept us from reaching Stokes Bay, maybe another day. The ferry escaping the bad weather on the mainland in the morning. when having breakfast in the restaurant, which can be seen at bottom left. A little more sun, better surf and 3 riders at Penninington Bay. The surf had some good clean 'tube' waves. Male (left) and female Australian Shelduck. 'Zorro' facing the way out at the end of the road (behind me/camera) to Red Banks. A bleak sky at Kingscote. The jetty had some colour. Anti Slip and Mermaid's Necklace. Some of the pole of the jetty need a little repairing. Fur Seals near the Jetty. Fur Seals at Kingscote Jetty. Little Black Cormorants and Black-faced Shags. Black-faced Shags with nice aqua-blue eyes. Could become slums in the future. On the penguin walk at Kingscote. These 4 Black Swans swam to a drain under the penguin walk to have a drink of fresh water and then swam back. This was at the Reeves Point historic site, Kingscote. The Old Mulberry Tree, which was sent from England and planted by the South Australian Company in 1836. These shells were in a bird-hide at Reeves Point. I thought I might find some of my own. Jetty remains at Reeves Point. The colour purple. It could be one of the salt bushes. A salt lake near Emu Bay. Not a good place to drive in. One metre high sea-weed banks at Emu Bay. The Echidnas down south are more straw coloured than the ones here. This Echidna wasn't too put off by my feet and just kept on looking for some more juicy ants to eat. A sign to warn motorist to lookout for wildlife just become another target. Someone really had it in for the joey. Scroll to bottom of page, Click on 'Older Posts' to go to Day 4 (next day).